Releasing a cover song? You need a license! With millions of songs available, Songfile makes licensing cover songs easy. 1. What is Songfile and why was it created? HFA, the largest issuer of mechanical licenses in the U.S., created Songfile, a fast and easy -to-use online mechanical licensing tool, specifically for the DIY market. A mechanical license is required by section 115 of the U.S. Copyright Act if you want to record and distribute a song that you didn’t write, or that you don’t otherwise own or control. 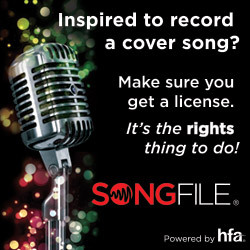 Songfile makes it easy to obtain mechanical licenses to release cover songs in physical or digital formats. 2. Are there fees associated with using Songfile? You must pay the current statutory royalty rate for mechanical licenses obtained through Songfile, as well as a processing fee. The statutory rate is set by section 115 of the U.S. Copyright Act. The current statutory mechanical royalty rate for physical recordings and permanent digital downloads is 9.1 cents for recordings of a song 5 minutes or less, and 1.75 cents per minute or fraction thereof for those over 5 minutes. You can find more information here. The processing fee is $16 per composition (plus the statutory mechanical rates) for fewer than 6 compositions in one transaction. If you license more than 5 compositions in one transaction, the processing fee is reduced to $14 per composition (i.e. for composition 6 and up). 3. What formats can be licensed through Songfile? Songfile can be used to obtain mechanical licenses for physical releases (e.g., CDs, cassettes, vinyl) as well as digital formats such as digital downloads and interactive streams. The full list of formats can be found here. 4. Is there a minimum/maximum number of reproductions per license? For physical releases and digital downloads, you can get a mechanical license for a minimum of 25 units and a maximum of 2500 units through Songfile. For interactive streams, you can get a mechanical license for a minimum of 100 streams, and a maximum of 10,000 streams. If you need licenses for more than 2,500 units, we suggest setting up a Licensee Account with HFA. More information can be found on that here. 5. Are any other licenses needed to release a cover song? If you’re releasing a straight cover version of a song in one of the formats listed above only a mechanical license is needed. 6. Does Songfile cover songs uploaded to YouTube? No. If you are distributing a video for commercial use that includes music you don’t own or control, you may need a synchronization license. You will need to contact the publisher(s) directly to obtain these rights. 7. Do I need to obtain licenses if I am not going to sell the recording of the song(s)? Unless your recording is covered under the fair use section of the U.S. Copyright Act, you need a license to release your song regardless of whether or not you are selling it. 8. Are the licenses immediately available, or is there a processing delay when using Songfile? 9. Which territories are covered by licenses obtained through Songfile? Mechanical licenses obtained through Songfile are only valid for products manufactured and distributed inside the U.S. and its territories.